Fall is a harbinger of winter, the season when flu and cold viruses make their grand entrance! Of course, you can develop a viral infection any time of year but the risk goes up as the temperatures drop and people spend more time indoors. The sage advice of washing your hands frequently to protect against viruses is right on target but nutrition matters too. Certain micronutrients that you get through diet help reinforce your body’s defenses against infections. Here are some of the key micronutrients that impact your immune system. 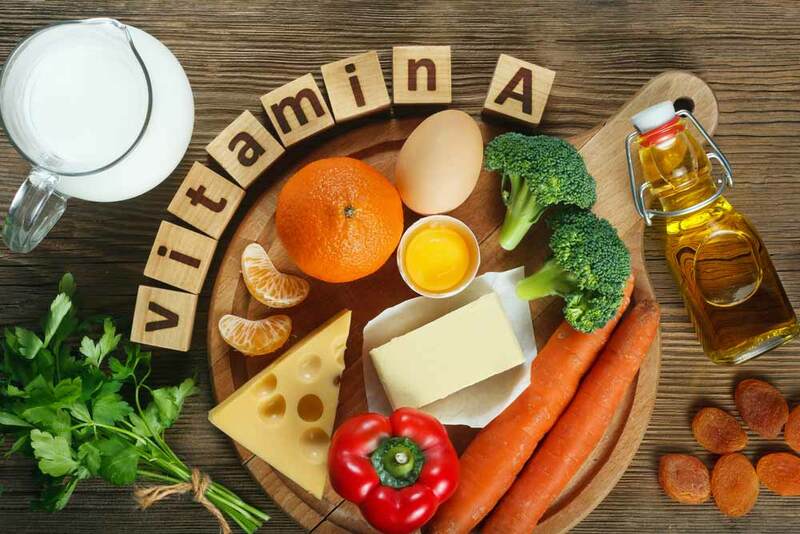 Researchers at Purdue University discovered that a metabolite produced from vitamin A called retinoic acid keeps immune cells in the gut in good working order. That’s important since 70% of your immune system lies in your intestinal tract. Being deficient in vitamin A makes it harder to avoid infection and to recover from one. In fact, studies show that vitamin A deficiency is linked with greater mortality from infections involving the lung and respiratory tract. Beef liver is a top source of vitamin A. Other good sources include seafood, cheese, eggs, milk, butter, and cod liver oil. These are all animal foods, but a precursor of vitamin A called beta-carotene is from plant-based foods, particularly leafy greens and orange fruits and vegetables. Some of the beta-carotene you take in through diet is converted to vitamin A, but studies show that up to 50% of women can’t make the conversion from beta-carotene to the working form of vitamin A, retinoic acid efficiently. Although beta-carotene has other benefits, including antioxidant and anti-inflammatory benefits, it may not be the best way to get your vitamin A. You also need a source of fat in your diet to absorb beta-carotene. Linus Pauling did much to increase awareness of vitamin C and its role in health. Although he advocated taking megadoses of vitamin C, there’s no evidence to show this protects against viral infections or other illnesses, although scientists are now looking at I.V. vitamin C as a possible adjuvant for some forms of blood cancer. With regard to colds, an analysis of 29 studies found that taking supplemental vitamin C (200 mg) did not reduce the frequency of colds. But, what is clear is that you need enough vitamin C in your diet for healthy immune function. A deficiency of vitamin C increases the risk of catching a cold or flu virus as immune cells called t-cells and phagocytes need it to function properly. These are cells that fight viruses, like those that cause the common cold. Cooked vegetables aren’t a reliable source of vitamin C as cooking destroys a significant percentage of vitamin C, especially if you cook veggies too long. Raw vegetables and fruit are the most reliable source. Bell peppers are a particularly good supplier of vitamin C and you can enjoy them raw in a salad. We think of oranges as being highest in vitamin C but papaya and kiwi are actually higher. Other good sources are strawberries and cantaloupe. To ensure you’re meeting your body’s vitamin C requirements, eat at least one piece of fruit high in vitamin C daily. Vitamin D is important for strengthening your innate immune system, a system that protects you against foreign invaders. It also helps moderate the immune response so that it doesn’t become so aggressive that it attacks normal tissues. Studies show that kids who are deficient in vitamin D are more susceptible to respiratory infections and adults with low vitamin D are more prone towards upper respiratory infections. It’s almost impossible to get enough vitamin D from diet alone. That’s because few foods are naturally rich in vitamin D, although wild-caught salmon and eggs contain respectable amounts. Some foods, such as dairy products and cereals, are fortified with vitamin D. Still, unless you eat a lot, it’s generally not enough to maintain a healthy vitamin D level. The best natural source of vitamin D exposure to the sun. How much sun exposure you need depends on the angle of the sun in the sky and factors like your age and skin color. Obesity, being over the age of 60, and having a darker skin color increases the amount of time you need to spend in the sun to make enough vitamin D. The best approach is to have your doctor check your vitamin D level and make recommendations. Zinc is a mineral involved in hundreds of chemical reactions within your body, many of which are key to healthy immune function. Unfortunately, as we age, our ability to absorb and utilize zinc goes down. Studies suggest that as you enter your 60s, you may need more of this essential mineral. Low levels of zinc increase the risk of infection but also dysregulate the immune system, creating inflammation. Some of the damage to tissues you get from an infection is due to an overly aggressive immune response. Zinc helps to moderate this overreaction and prevent tissue damage. Zinc is most abundant in animal-based foods, including fish, shellfish, and meat. If you eat a plant-based diet, you’ll need to be more attentive to getting enough of this mineral. You can do that by consuming whole grains, nuts, and seeds. Selenium is a mineral you need only in trace amounts, yet it’s critical for healthy immune function. If you take birth control pills, have an inflammatory condition of the intestinal tract, smoke, or drink alcohol, you’re more likely to have low or marginally low levels of this trace mineral. One of the top sources of selenium is Brazil nuts. In fact, depending on where the nuts come from, you can meet the day’s requirement for selenium by eating 1 or 2 – but don’t overindulge on Brazil nuts though. You can actually get TOO much selenium and suffer toxicity. Seafood, meat, poultry, eggs, and spinach are other good selenium sources. It’s important to note that getting enough of these micronutrients become more important as we age. Studies show that deficiencies in micronutrients are more common in older people. However, it’s vital that we eat a micronutrient-rich diet at all ages. Choose nutrient-dense, whole foods to meet your body’s micronutrient needs and help your immune system function at peak capacity. Nat Rev Immunol. 2008 Sep; 8(9): 685–698. doi: 10.1038/nri2378. J Investig Med. 2011 Aug; 59(6): 881–886. doi: 10.231/JIM.0b013e31821b8755.